To start the pushups on the ball exercise kneel in front of the ball and place your hands about shoulder width apart. Get up onto your toes. This is the position you attained in the plank on the ball on your toes. If you haven't attempted that exercise yet, I recommend you master it before going on to try this one. Keep yourself straight from your head to your heels. if you feel you can't lower yourself all the way without losing control of your trunk or shoulders, start with just a partial pushup. Start with lowering yourself just 4 inches and then push back up. You can increase the amplitude of your pushup as you gain strength and control. To protect your neck, keep your chin tucked and squeeze down as though you were holding a grapefruit between your chin and your chest. Press your tongue against the roof of your mouth to assist in stabilizing your neck. If you find this exercise too difficult try Knee Push ups on Ball, or go back and work on static exercises - Plank on the ball - on knees, Leaning Straight, and Single Arm Lean. 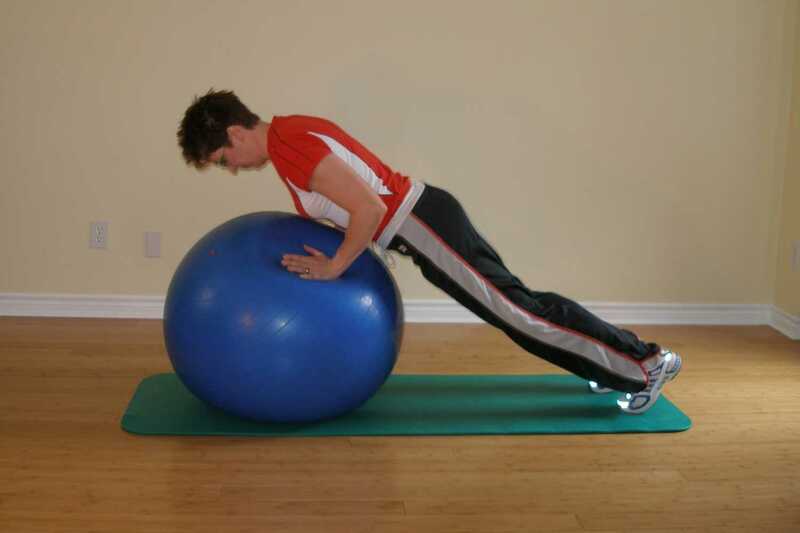 Try pushups on the ball with your feet on a stable stool or a BOSU (half ball). Add more air to your exercise ball, decreasing the area of contact with the floor and increasing instability of your pushup surface. Start the exercise with your feet closer together to narrow your base of support. Try keeping one leg straight up behind you as you do the pushup so that you have only one foot supporting you. This leaves only two points of contact with the floor, and one is mobile! This exercise is a natural progression of the straight armed plank on the ball. It is essentially a plank in motion. Throughout our day we are involved in activities that involve movement. If we can only maintain spinal stability when we are not moving, how functional is that? Here we have a static, stable, spine and we introduce limb movement in a closed kinetic chain. Because we are weight bearing through our shoulders we activate all the shoulder stabilizing musculature as well - the rotator cuff, and scapulothoracic muscles. Put the ball up on a wall so you are pushing up against the ball 4 or 5 feet up from the floor against the wall. This is like a wall pushup. 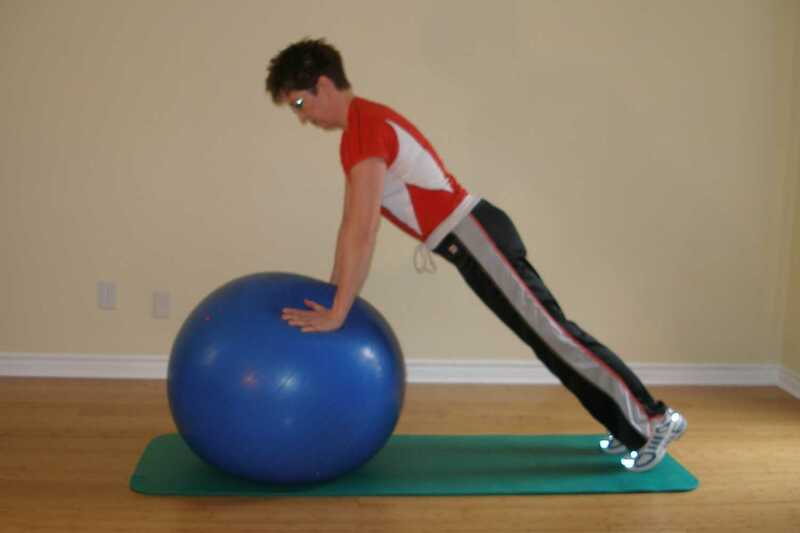 Prop your exercise ball into a corner on the floor to reduce wobbliness of your pushup surface. Take some air out of your exercise ball to increase the area of contact your ball has with the floor. Try using a bigger ball. The more vertically your are oriented, the easier the exercise becomes. Prop your feet against a wall behind you to prevent yourself from slipping away. Repeat pushups on the ball 6 times.